Shortly after they arrived, they purchased a piece of land from the local Pennacook tribal chief Cutshamache for the price of "six pounds of currency and a coat" and on the condition that Roger, a local Pennacook man, would still be allowed to plant his corn and take alewives from a local water source. Roger's Brook, a small stream which cuts through the eastern part of town, is named in his honor. In May 1646 the settlement was incorporated as a town and was named Andover. This name was likely chosen in honor of the town of Andover in England, which was near the original home of some of the first residents. 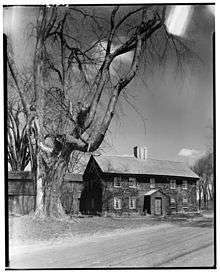 The first recorded town meeting was held in 1656 in the home of settler John Osgood in what is now the town of North Andover. The old burying ground in what is now North Andover marks the center of the early town. 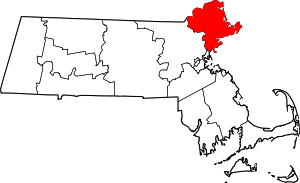 Contrary to popular belief, the towns split due to the location of the Old North Church, also located in what is now North Andover. The villagers from the southwestern part of the town were tired of walking all the way to the extreme north of what was then Andover, and decided to build their own church central to what is now Andover. Early on the general populace was concentrated together around the Old Center (North Andover) for protection from feared Indian attacks, but the Indians were fairly peaceful until the outbreak of King Philip's War in 1675. King Philip was an Indian who organized a revolt against the white settlers throughout most of New England. Six Indian raids occurred between 1676 and 1698 (the last led by Chief Escumbuit) until ever-increasing numbers of white settlers established control of the land. During the Salem witch trials in 1692, Andover resident Joseph Ballard asked for help for his wife from several girls in the neighboring Salem Village who were already identifying witches there. After visiting Elizabeth Ballard, the girls claimed that several people in Andover had bewitched her: Ann Foster, her daughter Mary Lacey Sr. and her granddaughter Mary Lacey Jr. During the course of the legal proceedings, more than 40 Andover citizens, mostly women and their children, were formally accused of having made a covenant with the Devil. 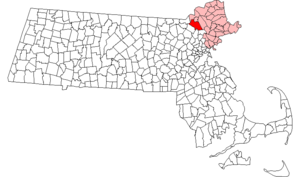 Three Andover residents, Martha Carrier, Mary Parker, and Samuel Wardwell, were convicted and executed. Five others either pleaded guilty at arraignment or were convicted at trial: Ann Foster, Mary Lacey Sr., and Abigail Faulkner Sr. (daughter of Andover's minister, Francis Dane) in 1692 and Wardwell's wife Sarah and Rev. Dane's granddaughter, Elizabeth Johnson Jr. in 1693. Those who were not executed were granted reprieves by Gov. William Phips, but the convictions remained on their records. In 1713, in response to petitions initiated in 1703 by Abigail Faulkner Sr. and Sarah Wardwell, Massachusetts Governor Joseph Dudley reversed the attainder on the names of those who were convicted in the episode. By 1705, Andover's population had begun to move southward and the idea of a new meeting house in the south end of town was proposed. This was strongly opposed by the people living near the original meeting house in the north, but the dispute was finally settled in 1709 when the Great and General Court divided Andover into two parishes, North and South. After the division of the two parishes, South Andover established the South Parish "Burying-Yard," as it was called, with early Andover settler Robert Russell the first to be interred at age 80 in December, 1710. But despite this split, the town remained politically one unit. 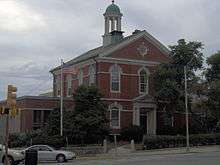 For many years Andover was geographically one of the largest towns in the Commonwealth of Massachusetts; in 1826 a third parish was established and West Parish Church was constructed on Reservation Road. In 1854, a measure was passed to divide the town into two separate political units according to the old parish boundaries. The name Andover was assumed by the more populous and wealthy West and South parishes, while the name North Andover was given to the North Parish. Among the Andover men who were representatives to the Massachusetts Constitutional Convention were Col. Samuel Osgood, Zebadiah Abbot, John Farnum and Samuel Phillips, Jr. Phillips – who would later go on to found Phillips Academy – was later appointed by John Adams to help draft the Massachusetts state constitution. During the burning of Charlestown (June 17, 1775) Andover townspeople hiked to the top of Holt Hill to witness it. Holt Hill is the highest most geographical point in Essex County and is currently part of the Charles W. Ward Reservation. On January 6, 1853, Benjamin "Bennie" Pierce, the 11-year-old son of President-elect Franklin Pierce was killed in a train accident in town. The Boston & Maine noon express, traveling from Boston to Lawrence, was moving at 40 miles per hour when an axle broke. The only coach, in which Franklin Pierce was also riding, went down an embankment and broke in two. (The baggage car and locomotive remained on the track.) Pierce's son was the only passenger killed, but it was initially reported that Pierce was also a fatality. The anti-slavery movement had many supporters in Andover long before the American Civil War began. William Jenkins - an ardent abolitionist and friend of William Lloyd Garrison - and several others provided stops on the Underground Railroad for runaway slaves. Harriet Beecher Stowe, author of Uncle Tom's Cabin, was a longtime resident. Her home, known as Stowe House, is now owned by Phillips Academy Andover. Her body is buried in Phillips Academy's cemetery. When the Confederate Army shelled Fort Sumter in 1861, a company of 79 volunteers formed. By the time the war ended in 1865, 600 Andover men had served in the Union Army. According to the United States Census Bureau, the town has a total area of 32.1 square miles (83.2 km2), of which 31.0 square miles (80.3 km2) is land and 1.1 square miles (2.9 km2) (3.49%) is water. Significant water areas include the Shawsheen River and Haggetts Pond, located in west Andover, which serves as the town's reservoir. Haggetts Pond was originally set apart from other waters, but since the late 1990s has had waters added from the Merrimack River, which constitutes half of the town's northern border, to supplement the growing needs of the town. Andover is also home to the Harold Parker State Forest, the Charles W. Ward Reservation, the Harold R. Rafton Reservation, the Deer Jump Reservation (along the banks of the Merrimack), as well as a very small portion of Lawrence's Den Rock Park. The town also has several golf courses. Andover has two stops, Ballardvale and Andover along the Haverhill/Reading Line of the MBTA Commuter Rail, providing rail service from Haverhill to Boston's North Station. Andover Station is also near the Third Railroad Station, a former Boston and Maine Railroad station which is listed on the National Register of Historic Places. The nearest small plane service is at Lawrence Municipal Airport in North Andover, and national service can be found at both Logan International Airport and Manchester-Boston Regional Airport, both within thirty miles of the town. Several routes of the Merrimack Valley Regional Transit Authority also enter the town, mostly in the north end of town. These include both service to Lawrence as well as a weekday commuter bus to Boston. In the town the population was spread out with 28.8% under the age of 18, 4.7% from 18 to 24, 27.5% from 25 to 44, 26.8% from 45 to 64, and 12.3% who were 65 years of age or older. The median age was 40 years. For every 100 females there were 92.9 males. For every 100 females age 18 and over, there were 87.9 males. The Andover Police Department provides full-time general law enforcement for the town. The town is also served by Troop A of the Massachusetts State Police. The Addison Gallery of American Art on the Phillips campus is open to the public. 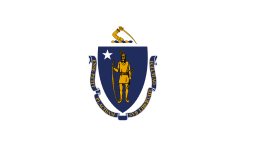 ↑ "The Official Website of Andover, Massachusetts". The Official Website of Andover, Massachusetts. Retrieved August 25, 2012. ↑ Terry Date. "New town manager sworn in". The Andover Townsman. ↑ "Andover" in The New Encyclopaedia Britannica. Chicago: Encyclopaedia Britannica Inc., 15th edn., 1992, Vol. 1, p. 387. ↑ "Demographics of Andover U.S. Census Bureau 2010 Profile" (PDF). ↑ Bailey 1880, p. 512. ↑ "Jane Means Appleton Pierce". History Central.com. Retrieved 2006-09-24. ↑ "American FactFinder – Community Facts". U.S. Census Bureau. Archived from the original on 2014-12-10. Retrieved 2012-07-08. ↑ Messenger, Brian (February 20, 2009). "Kerry, Tsongas say keep IRS center in Andover open: Local lawmakers want layoffs put off until 2012". Eagle-Tribune. Retrieved 11 October 2012. .
↑ "NTEU attempts to save jobs for 1,500 IRS employees". accountingweb. May 14, 2009. Retrieved 11 October 2012. .
↑ "GSA and Columbia Construction progressing with IRS' Andover Campus modernization". New England Real Estate Journal. December 24, 2010. Retrieved 11 October 2012. .